Easy Green: GREEN IDEA: It's Time! ATTENTION All Greenies! If you live in Southern California, its time! 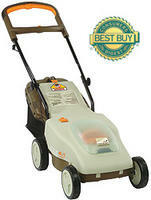 For the next month you can dump your old gas lawnmower, and get yourself a $400 cordless electric mower for just $100. Meanwhile you may remember that mowing your lawn once puts out more pollution than driving your car for a week. (See, Easy Green: Kill Your Lawnmower, 10/27/05) While electric lawnmowers are good -- for lots of reasons electricity pollutes less than gasoline -- the cord is a hassle. Starting May 13 the AQMD is once again selling cordless electric mowers for $100, plus the trade in of your old gas mower. If you still haven't replanted your lawn in xeriscape or something edible (we haven't, but we have Big Plans) at least don't dirty the air while mowing that pretend-prairie we are all so fond of, hmmmm. Thanks. See, it is easy being green. . .
Great tip! It's too bad I don't live in California. I didn't realize that mowing was that pollutive. Obviously it's bad but worse than a week of driving?! That's a pretty impressive statistic. Thanks for the info and keep the easy green ideas coming! Don't forget that dumping your old lawnmower isn't very green, so make sure it goes into metal recycling at the municipal dump or something similar and appropriate! Thanks I got one of those elictric lawn mowers. It is great! Thank you so much Roger! Hey Tracy -- thanks for the reminder. One key component to this SoCal program is that the AQMD collects the old mowers and handles the recycling effort, making it a win/win/win kinda deal . . .
That's an awesome deal. I had to stop mowing the grass for my dad when the gas mower made me wheeze, but sneaky dad had a solution: he bought a rechargeable electric mower. It's wonderful and much quieter.